As I tested the deck there were several problems I ran into. The first issue was the mana base. The deck was evenly split between green and red. The cards were also very greedy each requiring 2 red or green will to cast, which made it very difficult to cast cards on curve. The second issue was the deck was fairly slow and had very little interaction. The deck had a lot of trouble dealing with larger resonators and was very weak to removal. I next tried running a mostly red deck with green for crimson girl and Pricia, but the deck still struggled as it had almost no interaction and was easily stopped. These provide mana acceleration to play our resonators faster. These allow us to play our three cost resonators on turn two, which helps the deck win faster. This card was used mainly to protect Pricia from removal like Carmilla or Susano. It also enabled our green resonators to be cast on our opponent’s turn which also helps them dodge removal. This was the main reason the deck was built. She evolves our Ziz when she enters the field which is very good and she naturally givers herself a double power boos whenever she is pumped. She goes into overdrive when Crimson Girl flips getting a 4x boost with any pump spell. These gave us some protection against aggressive resonators. Preventing damage from a resonator for a turn is helpful in buying time until we can assemble a large enough force to overwhelm our opponent. She also provides mana acceleration allowing us to cast multiple spells in one turn. This was a small vampire package I put in the deck and it really over preformed. Elizabeth was actually a much better win condition than Pricia and was able to quickly become giant one we J-Activated. 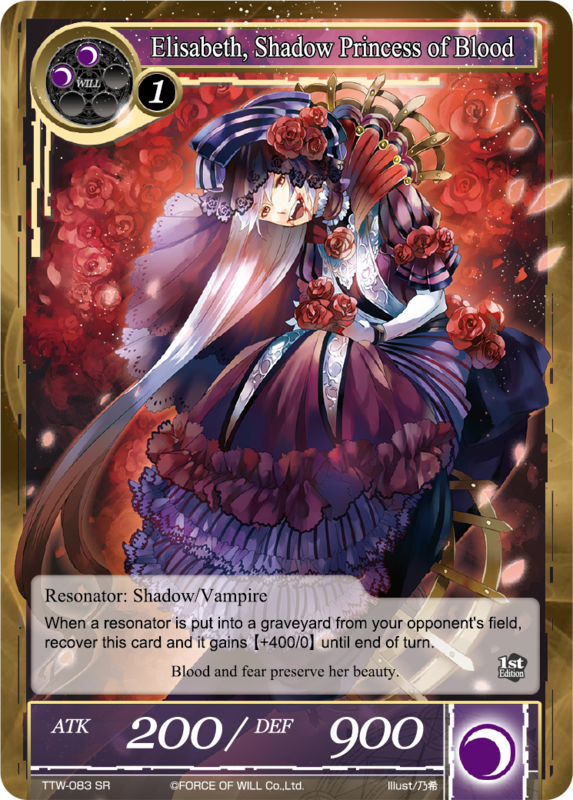 Carmilla gave the deck removal and a decent sized body to keep us alive against more aggressive decks. Lora provided a way to find whatever vampire we need at the time. The discard package of the deck, most decks I build with darkness in it have a discard package in them. This is because discard is so powerful in this game. It allows us to get rid of problem cards before they are problems and greatly limits the options our opponent has to play with. This allows us to J-Activate for free and gives a small boost to our team. In a pinch, this gives any of our resonators an extra boost. This card surprised me in how powerful useful it was in this deck. I acted as removal some of the time and was the main way Elizabeth killing chains were started. I liked having this card in the deck and it has shown that it deserves a place in the deck. This new iteration of the deck was a ton of fun to play and was surprisingly explosive. I had several games where I killed my opponent in one turn using Elizabeth. The interaction between Elizabeth and Little Red was amazing and extremely powerful. Being able to recover her and attack again with an added pump every time an opponent’s resonator dies is powerful ability. 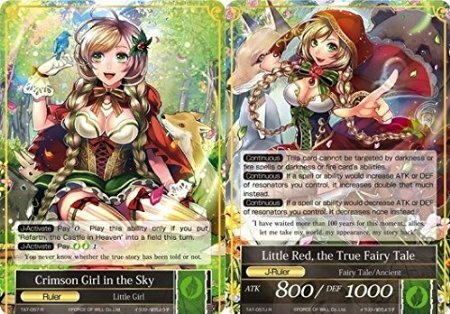 Compounding with the extra pump that Crimson Girl provides give the deck the capability to one turn kill opponents out of nowhere. The biggest issue I had with the deck was it was a little slow. Unfortunately in this meta, the deck is just a little too slow to really be viable at a larger tournament but could be a fun option to play at your local store. Moving forward I would probably cut some of the green and focus more on the vampires and disruption with the deck. I hope you enjoyed reading and keep your eye out for my next article here on Of Dice and Pens.